SUMMARY: A cute female spider tells young readers about spiders, where they live, what they eat, their eggs, and how they are beneficial to humans. WHAT I LIKED: Another super-cute addition to the Disgusting Critters series! I love the little spider telling her story. Every fact she gives includes a funny comment from the spider, which will help the reader remember the fact better. 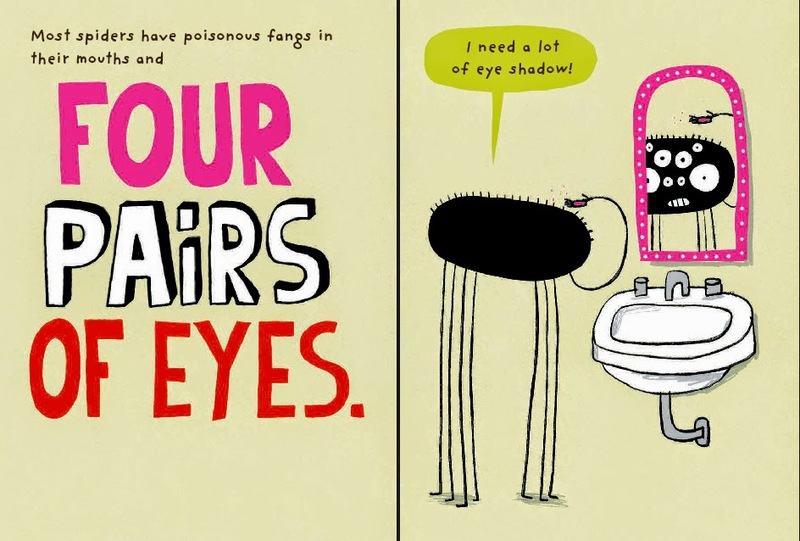 For example, for the fact that spiders have four pairs of eyes, the spider says "I need a lot of eyeshadow!" The facts are presented in a fun and engaging way that will appeal to young readers. Illustrations are simple and clean and compliment neutral colors with bold, bright colors like magenta and lime green. I really like the emphasis on the benefits of spiders and how spiders have more to fear from humans than we do from them. Overall, a very cute introduction to spiders that will make a great addition to any library that serves young children. WHAT I DIDN'T LIKE: A small gripe here, but I think the word "arachnid" should appear somewhere in the book (like on pages 8-9, where the spider tells the reader she is NOT an insect). ENGLISH LANGUAGE ARTS: Pair with Cronin's Diary of a Spider to discuss spider facts. Discussions of spiders and irrational fear of spiders is especially fun at Halloween. Could also pair with White's Charlotte's Web. OTHER: March 14 is National Save A Spider Day. THE BOTTOM LINE: Another cute, engaging addition to Gravel's Disgusting Critters series. STATUS IN MY LIBRARY: I am recommending the entire Disgusting Critters series to our elementary librarian. Others in the series include The Worm , The Rat , The Fly , The Slug , and Head Lice . Not sure they should be labeled as Disgusting though--spiders, slugs, and worms are incredibly beneficial to gardens, and even rats, flies, and head lice have their place in the world. Quality of information presented: 5/5--Includes great facts in a fun and engaging way. Love the focus on why spiders should be respected rather than feared. Front and back matter: 1/5--Since this is a short picture book (not intended for research purposes), things like an index or Table of Contents are not needed. Still, a glossary of terms like species, environment, poisonous, silk, eggs, abdomen, mimic, prey, etc. would be useful. No bibliography or "Further Reading" section is included, either. Engrossing: 5/5--Very easy to read and understand. Children will definitely enjoy this fun introduction to spiders. Writing: 5/5--This book will make learning about spiders fun. Love the humor! Appeal to target audience: 5/5--Especially useful for PreK-Grade 2. Appropriate length: 5/5--It's just right! CONTENT: No content concerns for even the youngest readers. Spiders in the book are never depicted as scary.